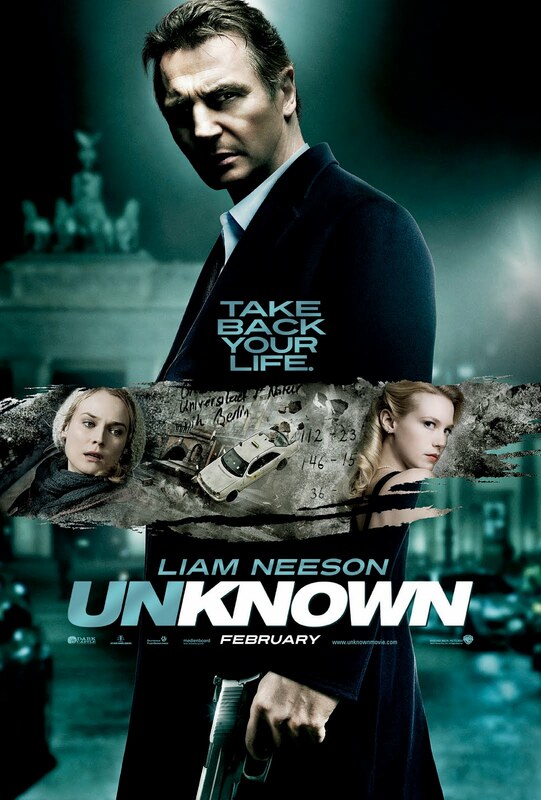 The Billionty-Oneth Geek: Liam Neeson in UNKNOWN!!!!!!!!! 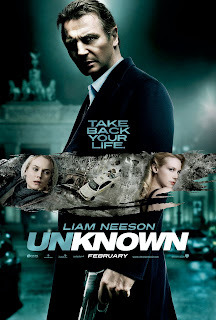 The story follows a scientist named Martin Harris (Liam Neeson) who arrives in Germany with his wife (January Jones) for a conference. Shortly after arriving at their hotel, he realizes that his luggage and identification was left at the airport and takes a cab back to retrieve it. However, on their way back, the cab gets into a little traffic scrimmage and ends up going off a bridge into the river below. Harris is trapped and drowns, that is until the superhero-like cab driver rescues and resuscitates him. He wakes up at a local hospital, and finds it odd that no one knows who he is or where he came from. He returns back to the hotel to find that not everything is as it once seemed; he finds his wife, but unfortunately, she does not recognize him. And in fact, some stranger is posing as her husband, and claims to be exactly him, Martin Harris. A mystery, dear reader, is afoot! As a whole, the movie is solidly-pretty-alright; a 3 out of 3 on the 7 out of 10 scale, I’ve been saying. I think where Taken has the edge is with its intense action. Unknown is more methodic and slow-plodding, more apt for a mystery story, for which it mostly is. It’s not until the last 20 to 30 minutes where we see some semblance of action. What made the movie enjoyable is Liam Neeson. He has this very commanding onscreen presence where if he talked, you were sure to listen. He did not pwn as much as in Taken, but he made up for it with some strangely timed one-liners. Aidan Quinn on the otherhand, as the villain, I couldn’t buy. He just doesn’t come across as a believable bad guy. Frank Langella on the otherhand, even before he says anything, you know he’s up to something. Langella has a knack for playing this type of character; an ominous and mystery well-dressed old man. As a whole, it’s worth a rental at worst. If you’ve got the time and money, then on the big screen couldn’t hurt. It’s a zany story, but thanks to Liam Neeson, it works. Until next time, later geeks!